If an officer wants to talk, something’s usually wrong. Plucked from his unit, Eddie Dawson knows trouble awaits. The Netherlands is under Nazi invasion from land and sea. Amsterdam is besieged. But the Nazis aren’t interested only in conquest; they want the enormous Dutch oil reserves for their war effort. 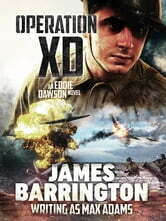 Based on true events, this latest James Barrington WW2 thriller is intense and unputdownable. Buckle up!